5 Things DirectAccess Administrators Should Know About Always On VPN | Richard M. Hicks Consulting, Inc. I have read a few things about Always On VPN feature. But I have a question about HA in front of the Remote Access Servers. We use Citrix NetScaler as a NLB. When I read the MS documentation, it state and that you need to use IP-HTTPS. As we only want to leverage the IPv4 and not IPV6. How can this be accomplished? 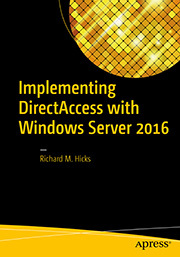 Always On VPN and the Future of Microsoft DirectAccess | Richard M. Hicks Consulting, Inc. Always On VPN for DirectAccess Administrators – Richard M. Hicks Consulting, Inc. 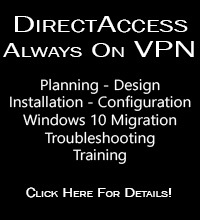 Always On VPN Device Tunnel Configuration Guidance Now Available | Richard M. Hicks Consulting, Inc.
DirectAccess vs. VPN | Richard M. Hicks Consulting, Inc.
3 Important Advantages of Always On VPN over DirectAccess | Richard M. Hicks Consulting, Inc.
DirectAccess and FIPS Compliant Algorithms for Encryption | Richard M. Hicks Consulting, Inc. Always On VPN Windows 10 Device Tunnel Step-by-Step Configuration using PowerShell | Richard M. Hicks Consulting, Inc. Always On VPN and Windows Routing and Remote Access Service (RRAS) | Richard M. Hicks Consulting, Inc. Always On VPN Protocol Recommendations for Windows Server Routing and Remote Access Service (RRAS) | Richard M. Hicks Consulting, Inc.
Network Interface Configuration for Multihomed Windows Server 2012 DirectAccess Servers | Richard M. Hicks Consulting, Inc.
What is the Difference Between DirectAccess and Always On VPN? 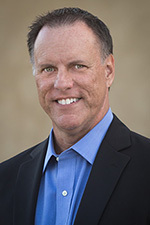 | Richard M. Hicks Consulting, Inc.
Troubleshooting Always On VPN Errors 691 and 812 | Richard M. Hicks Consulting, Inc. Always On VPN and Third Party VPN Devices | Richard M. Hicks Consulting, Inc.